Thank you! We strive to respond to all inquiries by the next business day. Keep up with the latest sales, discounts, news, product releases, and projects here on our blog. The compost pile, a favorite hangout for local rodents. Custom aspheric IR illuminator at only ~60 meters as seen through our digital night vision setup. A local predator shows up to hunt one of our spots. We left him to it. Rodents..... they're a problem. Poison creates ecological issues, trapping is indiscriminate, however night vision combined with an airgun can take a good bite out of the local population if you're so inclined. In this particular case we're using a digital night vision rig that sees into the infrared spectrum (hence the odd colors, leaves reflect IR light so appear white), which blissfully uses the existing scope via an adapter. And, of course, we're using an STO Custom IR illuminator. We'll need to test further, but with just a crescent moon out we could easily spot beyond 500 yards with it. This system on a more powerful rifle would be ideal for larger game at longer range, such as coyotes. Excellent brightness is the key to sharp high resolution images, in this case at about 60 meters to the target area, I had enough light and resolution to watch individual insects fly, and see the spider's eyes in the grass. Of course, using a lamp has an added benefit of lighting up the eyes of anything with tapetum lucidum. This includes our rodent prey. Turns out we weren't the only ones hunting rodents that night. 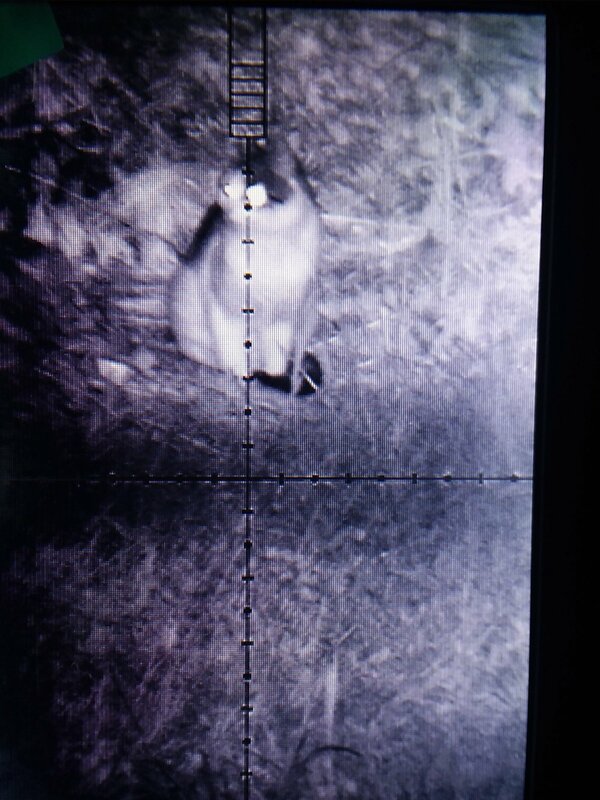 This local cat showed up to hunt our spot, or perhaps we were hunting his. Not to fear though, we hit up a couple other spots and had a successful night.